Native American Dollars were authorized under H.R. 2358 The Native American $1 Coin Act. This legislation provides for a new series of circulating dollar coins celebrating the contributions and accomplishments of Native Americans. A different reverse design will be issued each year. The obverse of the each coin will feature the same design used on the Sacagawea Dollar from 2000-2008 with a slight modification. The date and mint mark will be moved to incused edge lettering on the edge of the coin. The remaining inscriptions “Liberty” and “In God We Trust” will continue to appear on the obverse of the coin. The obverse was originally designed by Glenna Goodacre. The reverse of the coins will feature a unique design each year. These will celebrate important contributions of Native American tribes or individuals. Until at least 2016, a time line of chronological events and contributions will be featured annually, to coordinate with the issuance of coins in the Presidential Dollar series. After the conclusion of the Presidential Dollars series, the Native American Dollars series will continue in any order determined appropriate. 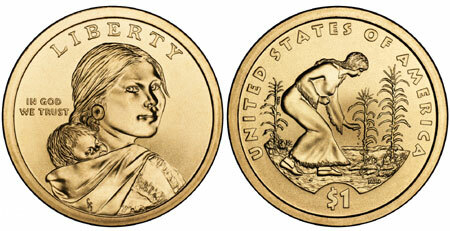 The 2009 Native American Dollar reverse design features a Native American woman planting seeds using the Three Sisters method of planting. The 2010 Native American Dollar reverse depicts the Hiawatha Belt, which is a visual record of the Haudenosunee or Great Law of Peace. Native American Dollar coins will circulate along side the Presidential Dollar coin issues, making a total of five different golden dollars issued each year. The authorizing legislation specifies that at least 20% of the total mintage of dollar coins for each year must be Native American Dollars. It also encourages the Secretary of the Treasury to carry out an aggressive, cost-effecting campaign to encourage use of the new dollar coins.